For any fluid there is a relationship between the temperature and pressure at which it changes phase, that is either boils or condenses. The higher the pressure the higher the temperature at which the phase change will take place. When a fluid evaporates it absorbs heat from its surroundings and when it condenses it releases heat to its surroundings. The vapour compression refrigeration cycle has been devised to make use of these physical characteristics to transfer heat from one place to another. When it is used for the purpose of cooling it is called a "refrigerator" and when it is used to heat it is called a "heat pump". By using suitable compounds or "refrigerants" and varying the pressure of the refrigerant, they can be used to absorb or reject heat at normal atmospheric temperatures. If as a low-pressure liquid the refrigerant will evaporate at around room temperature it will extract heat from the room. It will of course have to become a gas which if then pressurised it can be made to condense at a high outdoor temperature thus releasing the heat to atmosphere. It can be then reduced to its original pressure and the process is repeated. The compression of gas is achieved by using a compressor and the reduction in the pressure of the liquid is effected by passing it through a pressure-reducing valve called an expansion valve. Suppose a cold store room is to be maintained at –10 oC. The amount of heat entering the room can be reduced by insulating the walls floor and roof, but some heat will still get through. To remove the heat from the room a refrigerant at a lower temperature would be required, say –16 oC. If R134a was used as the refrigerant, it would need to boil at a pressure of 1.5 bar abs. If R134a was placed in a container with its outlet restricted to maintain a pressure of 1.5 bar abs then heat would flow from the room at –10 oC into the refrigerant providing the latent heat to evaporate the refrigerant at –16oC. 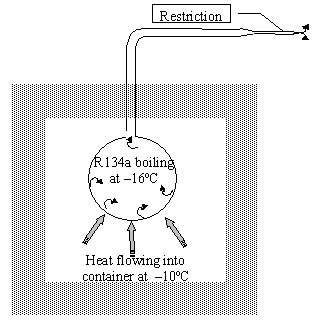 This would produce refrigeration until all the R134a had evaporated (see Figure 1). Some temporary refrigeration systems use the refrigerant only once to provide cooling, however, this is wasteful and damaging to the environment. Therefore, for most refrigeration systems the remainder of the refrigeration cycle is concerned with re-using the refrigerant i.e. removing the latent heat from the vapour, so that it condenses back into a liquid. To condense the refrigerant, it must reject heat to some heat sink. The most common heat sinks are atmospheric water and air, which are normally at a much higher temperature than the refrigerant in the evaporator. In this case we are rejecting heat from the refrigerant to atmospheric air at around 25 oC and this requires the R134a refrigerant to condense at a higher temperature of say 40oC. To condense at this temperature, the R134a needs to be pressurized to approximately 10 bar abs. Thus the escaping R134a is passed through a compressor which raises its pressure to 10 bar abs and then into a condenser where air at 25 oC is used a heat sink with rejected heat from the refrigerant allowing the refrigerant to condense to a liquid state at approximately 40 oC. To reuse the refrigerant and thus make the cycle continuous it must then be returned to the evaporating vessel. To maintain the difference in pressure between the condensing and evaporating refrigerant and to match the return of liquid to the rate at the compressor pumps the vapour, the flow is regulated by an expansion valve. 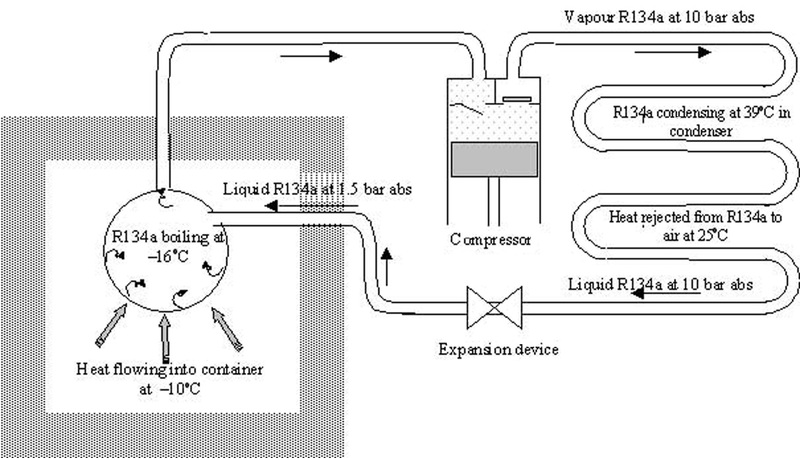 The 4 main components: the evaporator, compressor, condenser and expansion device are typically shown connected in Figure 2. The design parameters of each component will vary according to the requirements of the particular application for which they are designed. The temperatures and pressures around the cycle also change to suit the temperatures of what is to be refrigerated and the temperature of the condenser heat sink. Temperature-pressure relationships together with the properties of refrigerants in both vapour and liquid states for a wide range of evaporating and condensing conditions are listed in tables of refrigerant properties.